Nahanni Country is a true adventurer's paradise. Whether you're looking to fish in remote lakes and rivers, or kayak the waters of the Nahanni National Park Reserve, this is the region to visit. Get on your gear, and join a river touring guide for an escorted trip through this gorgeous park. Discover first-hand why this was the first national park in the world to be designated as a national site of universal importance by UNESCO. The 'tropics of the Northwest Territories' as it is known, is a perfect pickerel fishing spot. 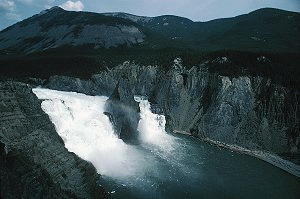 One of the main gateways to Nahanni National Park Reserve, FortSimpson is also a premier fishing and hunting centre. Bring a picnic and enjoy the stunning Twin Falls Gorge Territorial Park, where the views are breathtaking, and the wildlife bountiful.